The stunning moon and clear skies overnight resulted in the seemingly inevitable 'clear out' this morning. 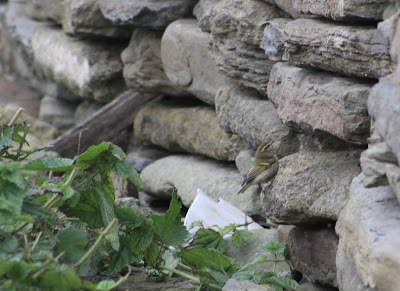 That said, we did still manage to unearth 11 Yellow-browed Warblers, so goodness knows how many were present yesterday evening. Most other birds were non-movers with the Northern Harrier present all day, a Barred Warbler at the Observatory but there were now 4 Lapland Buntings while Snow Buntings are creeping ever closer to a record count with 762 on the isle. A good flock of 50 Tufted Ducks was on Bridesness Loch, 37 Pink-footed Geese passed over, 6 Ruff were still with us while a House Martin and Tree Pipit were the best of the rest. A still and largely quiet morning with a developing southerly breeze brought a sudden flurry of birds late on - we can't help but feel we missed a trick today! 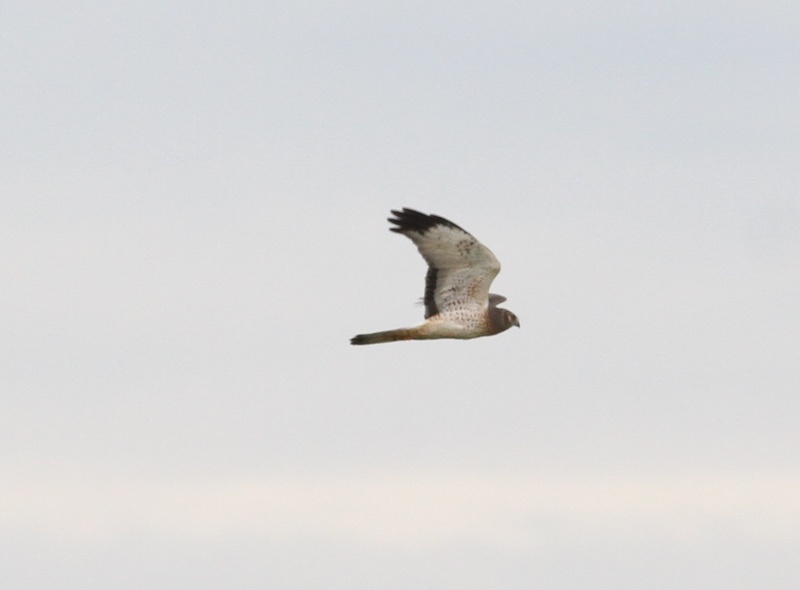 The handsome male Northern Harrier continues to delight while the new birds resulted in 30 Redwings, 3 Tree Pipits, 13 Rock Pipits, a Whinchat, 3 Barred Warblers (Ides Taing, School, Obs), 6 Yellow browed Warblers, 2 Pied Flycatchers, 2 Lapland Buntings and 719 Snow Buntings being counted. An arrival of Wildfowl also saw counts of 237 Wigeon, 183 Teal, 3 Gadwall, 13 Shoveler and 9 Red-breasted Mergansers but we're starting to think Pink-footed Goose passage has been and gone overnight with just 5 seen today. A 2 hour sea-watch yielded totals of 24 Sooty Shearwaters, 272 Fulmars (including to 'blue' phase), 41 Kittiwakes, 3 Puffins and 407 Auk sp and the best of the waders were 13 Black-tailed Godwits and a Jack Snipe. A light southerly wind and sunshine for most of the day didn't really seem likely to produce many new arrivals but nonetheless, a good day's birding was still had by all. 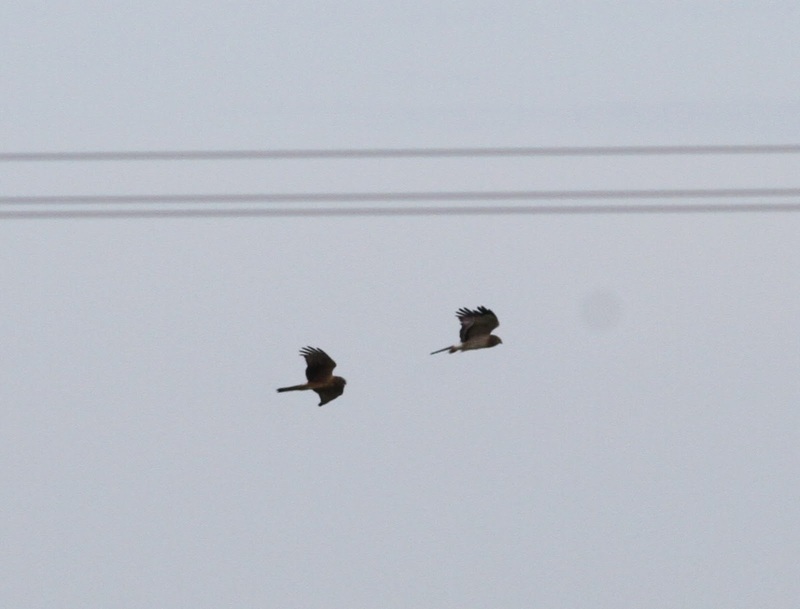 The male Northern Harrier performed well all day (including a flypast of the Obs during breakfast!) and in the afternoon it was joined by 2 other Hen Harriers - first a juvenile which was seemingly escorted into leaving the island to the south and then by an adult male which offered great comparison. An adult Pomarine Skua past Bridesness was the first of the autumn, with a juvenile Arctic Skua also in Nouster Bay and 7 Great Skuas seen. Newcomers on the land were limited to a Collared Dove, 3 Whinchats with 2 Yellow-browed Warblers (Holland and Senness) and 501 Snow Buntings also around. Both Meadow and Rock Pipit numbers increased as more birds passed through with 301 and 14 respectively and also up were Bar-tailed Godwits to 63 birds. 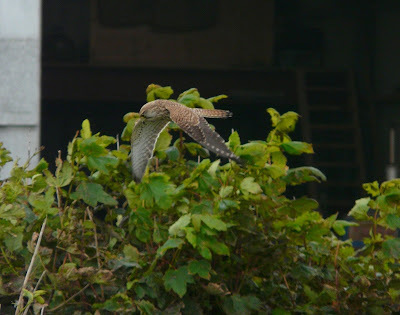 Heavy rain in the morning cleared to a generally grey day but some good birds made up for the dreary conditions. Absent during the first half, there was much relief for newly arrived birders when the male Northern Harrier reappeared and showed well in the afternoon. 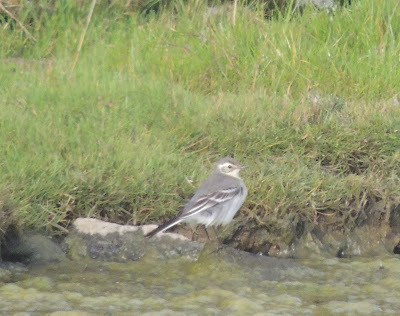 An elusive Richard's Pipit in the Breck/Sandar area was the best new arrival while also of note were another 201 Pink-footed Geese south, 3 Yellow-browed Warblers and a Lapland Bunting at Nether Linnay. 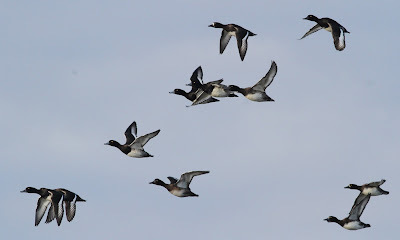 On calmer seas 12 Red-throated Divers, 6 Great Northern Divers and 2 Sooty Shearwaters were recorded and increasing numbers of wildfowl returned figures of 173 Wigeons, 43 Tufted Ducks, a Pintail and 5 Red-breasted Mergansers. 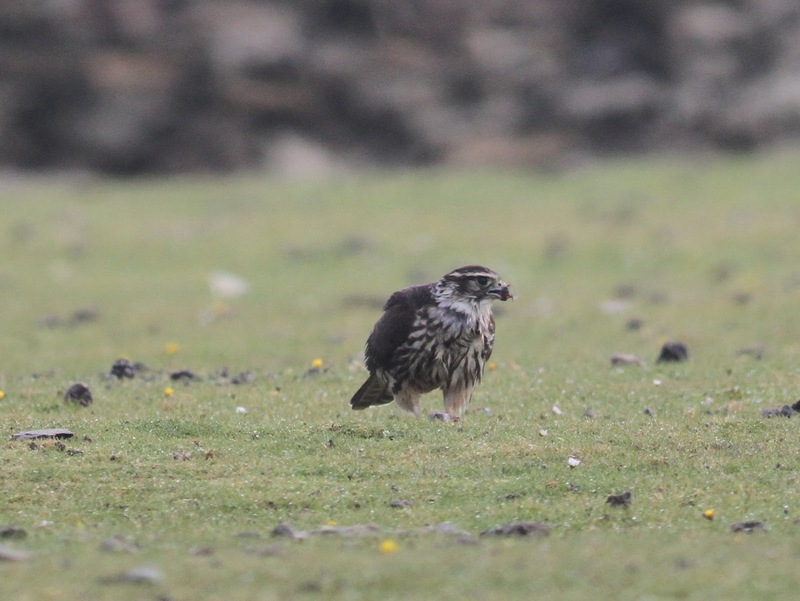 Similarly, waders on the up included 231 Snipe, 2 Jack Snipe and 25 Black-tailed Godwits while 2 Sparrowhawks, 3 Kestrels and 2 Merlins were the other raptors seen. 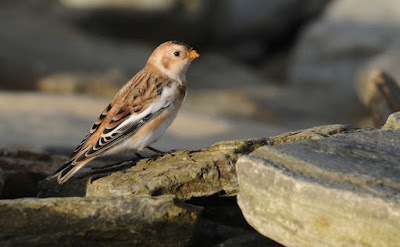 A group of 8 Ravens south was the second flock of the week, a Robin was new but a Whitethroat, 2 Lesser Whitethroats and many of the 413 Snow Buntings were likely lingering birds. Wow! Wow! Wow! Today we were treated to something really special, of real quality which was wholly unexpected. 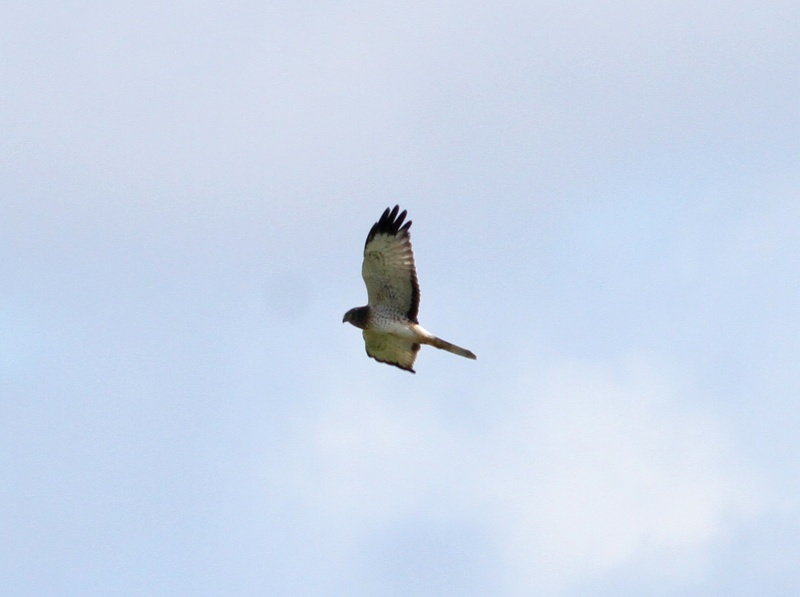 There was much sprinting about over tussock fields followed by some 'wacky racers' like speeding around the island in Landrovers from mid-morning after a totally stunning, adult or sub-adult male NORTHERN HARRIER flew past Mark at Lairds Park mid-morning. This, about the tenth British record of the North American form of our Hen Harrier went on to perform spectacularly as it toured the island for the rest of the day. It subsequently transpired this was the 'Hen Harrier' seen yesterday and though currently not recognised as a full species by the UK committee's, this position seems likely to change in the near future - either way it is one fantastic looking raptor! There were some other new birds seen today with the first 3 Lapland Buntings of the autumn in fields at Greenwall, 5 Yellow-browed Warblers spread about the island and another high count of 441 Snow Buntings. There was the first significant movement of Pink-footed Geese with 418 heading south while 41 Tufted Ducks at Bridesness was also a good count. 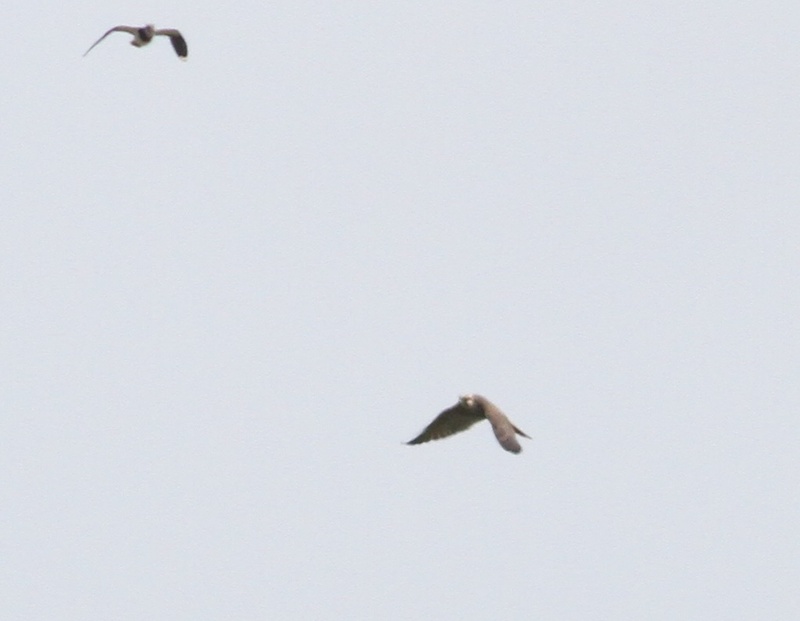 Other odds and ends included 8 Grey Herons, a female Sparrowhawk, Jack Snipe and 12 Black-tailed Godwits. A bright and sunny morning transformed later in the afternoon with some horrible, heavy showers in a light westerly wind. 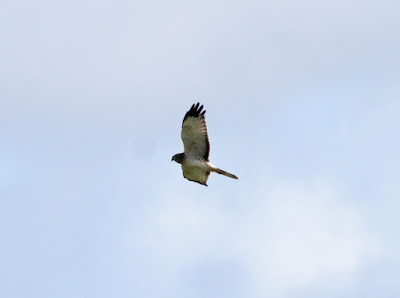 Our second Common Buzzard of the year, over the north of the isle was a surprise arrival and along a similar theme a Hen Harrier was also new. 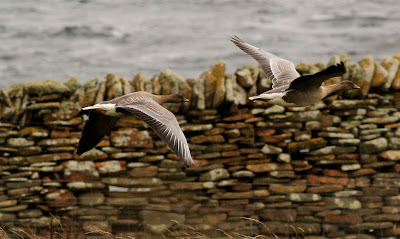 Another 70 Pink-footed Geese passed south in 3 flocks hinting at things to come while 10 Red-throated Divers were seen off the coasts, 2 Sooty Shearwaters on a brief sea-watch and there were 2 Little Stints at Bridesness Loch. An obliging Red-breasted Flycatcher at Howar was the pick of the passerines and also of note were 3 Redwings, 17 Yellow-browed Warblers, a handful of other warblers which included yesterdays Barred Warbler and a Whitethroat, 5 Goldcrests, 2 Siskins, a male Crossbill and an impressive 499 Snow Buntings. 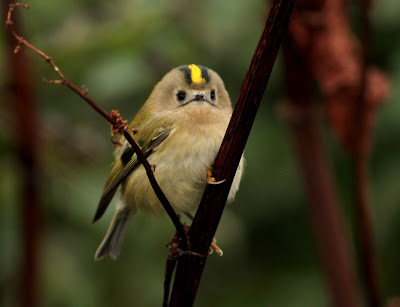 Once again there was a small number of newcomers to encourage current visitors and staff alike to continue with their quest for that elusive rarity! Most of the movement was early on with some visible passage which included a flock of 13 Ravens (north), 57 Skylarks (of which 33 went south), 431 Meadow Pipits and at least 260 Snow Buntings - likely many more. 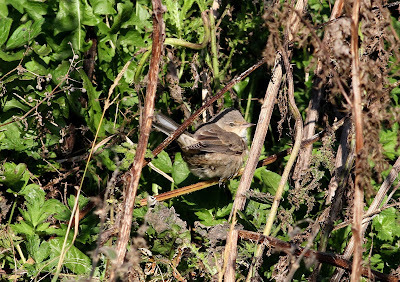 Counts of grounded passerines came to 3 Whinchats, a smart Redstart, 2 Fieldfares, 3 Song Thrushes, 10 Redwings, a Barred Warbler trapped and ringed at Holland gardens, 3 Lesser Whitethroat - including an interesting individual with biometrics and characteristics of the Siberian form 'blythi', 15 Yellow-browed Warblers, 9 Goldcrests and a Tree Sparrow. The first 5 Pink-footed Geese of the autumn moved south in the afternoon and there were also still at least 2 Little Stints at the north end, the Wood Sandpiper and 2 Jack Snipe were flushed. A light north-easterly wind did the trick, bringing a long overdue rarity (although recently downgraded in status by several influxes) in the form of a Blyth's Reed Warbler in the weedy fields at Senness. 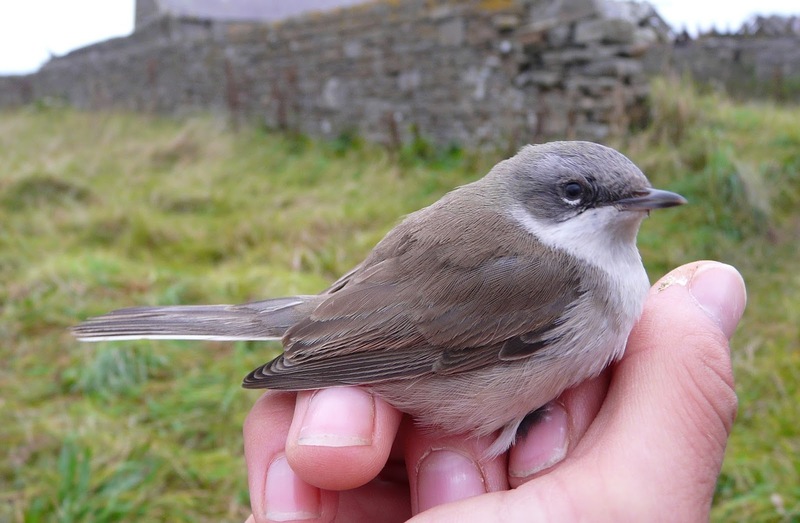 This the thirteenth island record and first since 2013 remained elusive so was trapped and ringed to confirm identification beyond any doubt. At least 13 Yellow-browed Warblers were present and some of these were likely to be new individuals following yesterdays major arrival. 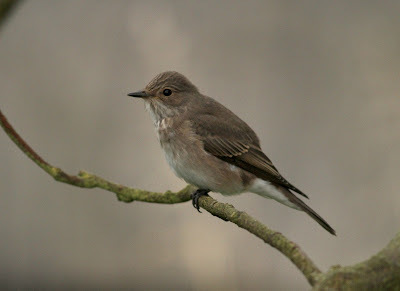 A Rosefinch at Breck was probably the bird seen at the weekend and the Red-breasted Flycatcher remained in Holland gardens. Also seen on the passerine front were 3 Whinchats, 51 Wheatears, 2 Fieldfares, 6 Song Thrushes, the first Redwing of the autumn, a Lesser Whitethroat, 2 Garden Warblers, 9 Blackcaps, 3 Goldcrests and 164 Snow Buntings. 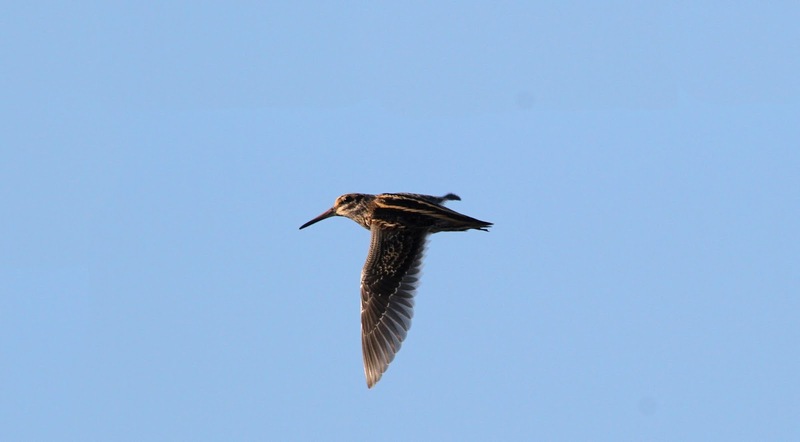 A mobile Wood Sandpiper was probably new, at least 4 (possibly 8) Little Stints remained at the north end, a Jack Snipe was at Ancum Willows and Black tailed Godwits and Ruffs increased to 29 and 11 respectively. 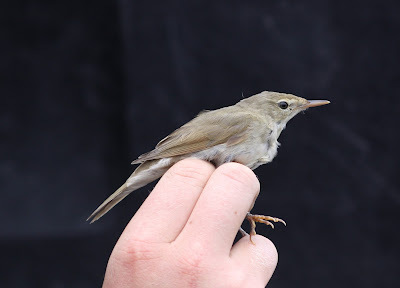 A calm day with occasional drizzly showers which turned into a record breaking one on the island for an always popular 'Sibe'. 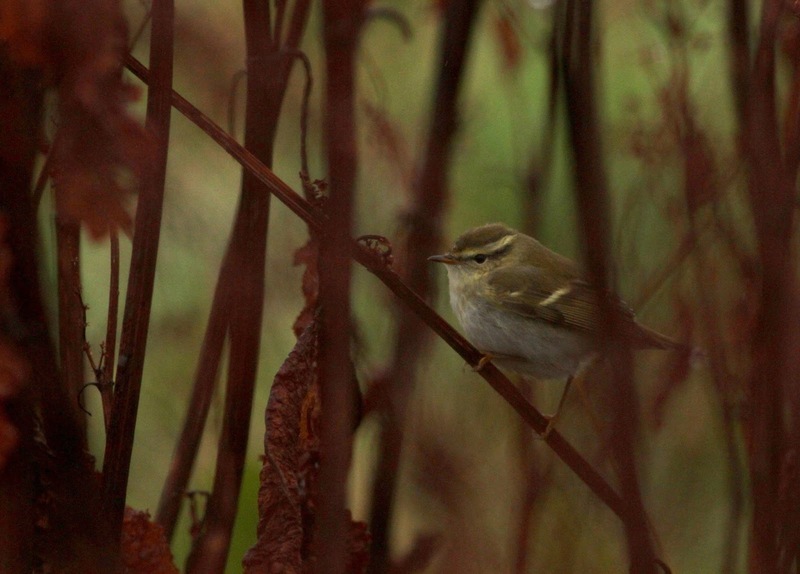 Everyone likes a good Yellow-browed Warbler and after half a dozen had been logged in the morning, they started turning up 'all over the shop' in the afternoon. 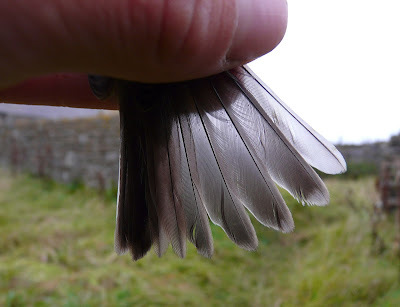 The previous day total record stood at 23 birds (27th Sep 1992) and today this was smashed with a minimum of 31 present. 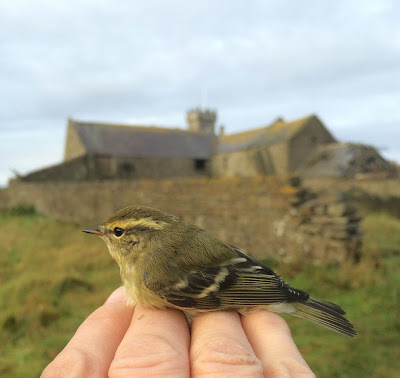 Individuals were spread far and wide but clear hotspots were the Holland/Old Kirk area (7), Observatory (5-all trapped and ringed with 3 caught at the same time! 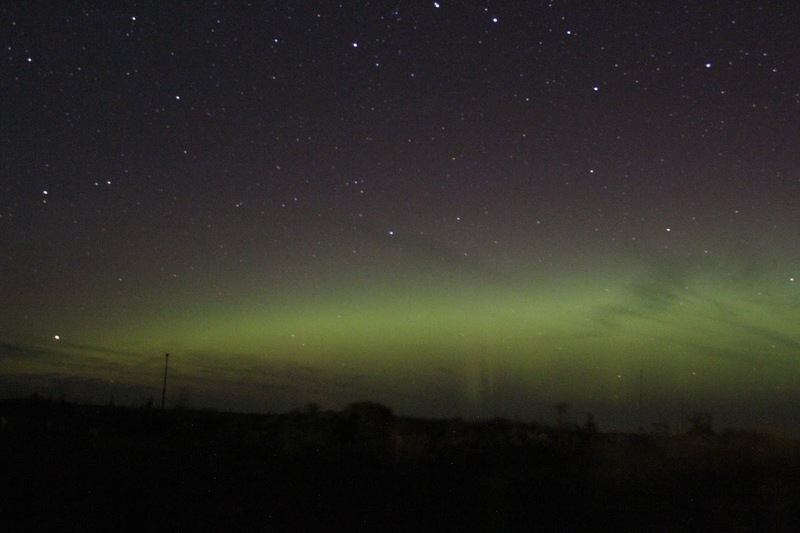 ), the Garso area (5) and Westness (3). 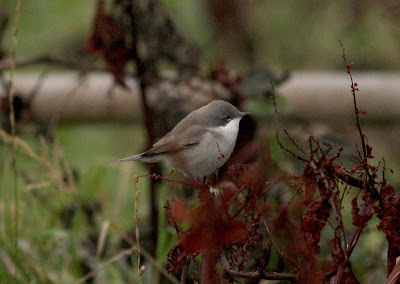 A Red-breasted Flycatcher at Holland gardens was also well appreciated while the other warbler species registered meagre totals 13 Blackcaps. 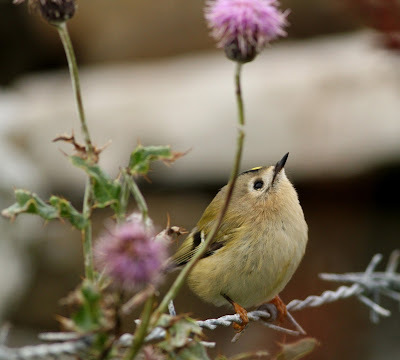 2 Willow Warblers and 4 Goldcrests. 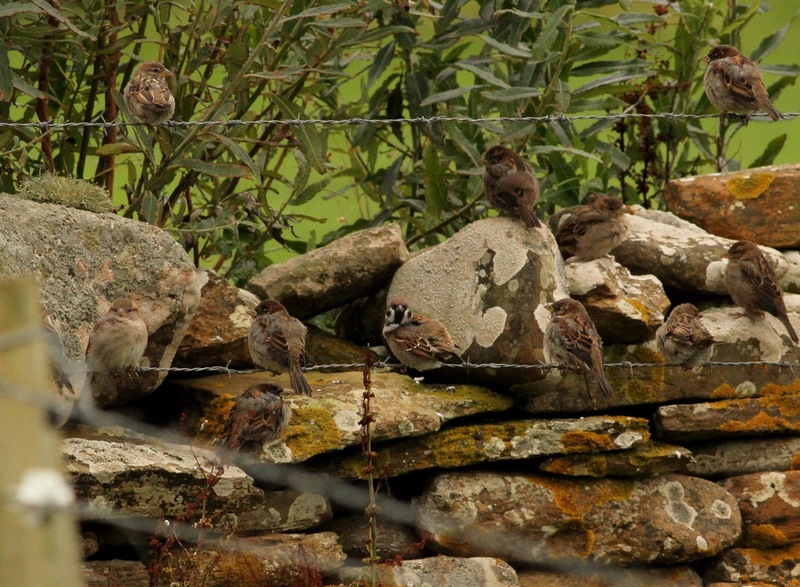 A Common Rosefinch was at Garso, 225 Snow Buntings were counted while birds on the move included 69 Swallows, 277 Meadow Pipits and 11 Rock Pipits. 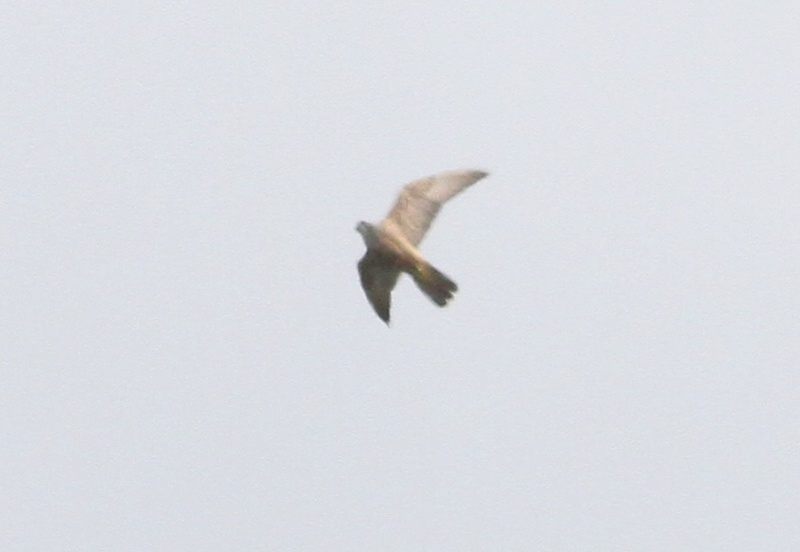 More raptors than yesterday were seen with 3 Sparrowhawks the most notable, while Little Stints increased by 1 to 4. A Pintail was new as may some of the 10 Grey Herons while a marked increase in Black-tailed Godwits (to 14) and Snipe (to 365) was also evident. Another day of similar, non-descript weather with a little bit of change. 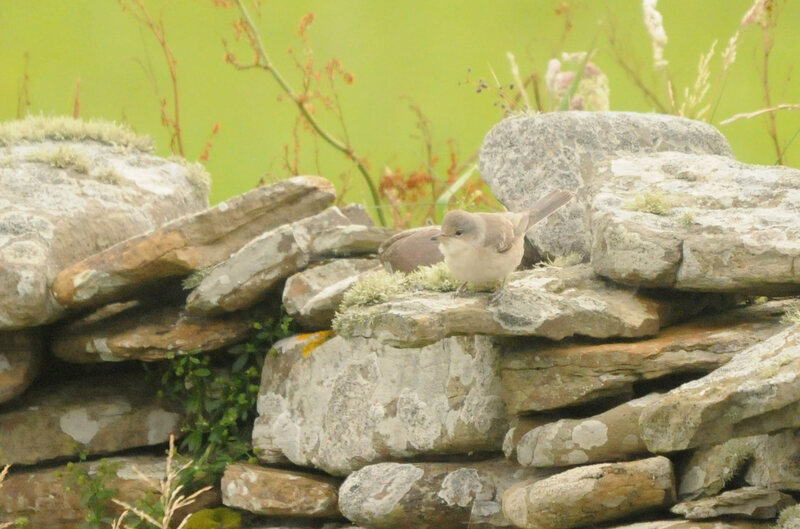 There was some visible movement of diurnal migrants in a southerly direction early on but otherwise it was long-stayers which were the most appreciated. The ringed Yellow-browed Warbler was still at Holland, the Wryneck was seen at the Observatory again and a juvenile Marsh Harrier returned to the island once more. 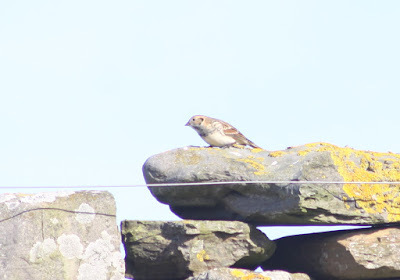 A Common Rosefinch briefly with the House Sparrows at Brigg was definitely a new bird, and there was likely a second also there while the Little Stint flock at the north end increased to 3 birds. Counts of more routine fare came to 11 Red-throated Divers, 5 Kestrels, a Sparrowhawk, the first Jack Snipe of the autumn, 2 Sand Martins, 63 Swallows, 199 Meadow Pipits, 11 Rock Pipits, a Redstart, 2 Lesser Whitethroats (the most notable of the new warblers), a Tree Sparrow and 260 Snow Buntings. The 'static' period of weather, with no particular change continued for another day with many species lingering and present in similar numbers to the last few days. Highlights were the Wryneck still in Nouster dunes, 4 Yellow-browed Warblers (at least 3 of them old), 2 Little Stints and at least 270 Snow Buntings. Raptors were seen throughout the day with at least 5 Kestrels, 3 Merlins, 2 Peregrines and a Sparrowhawk featuring. 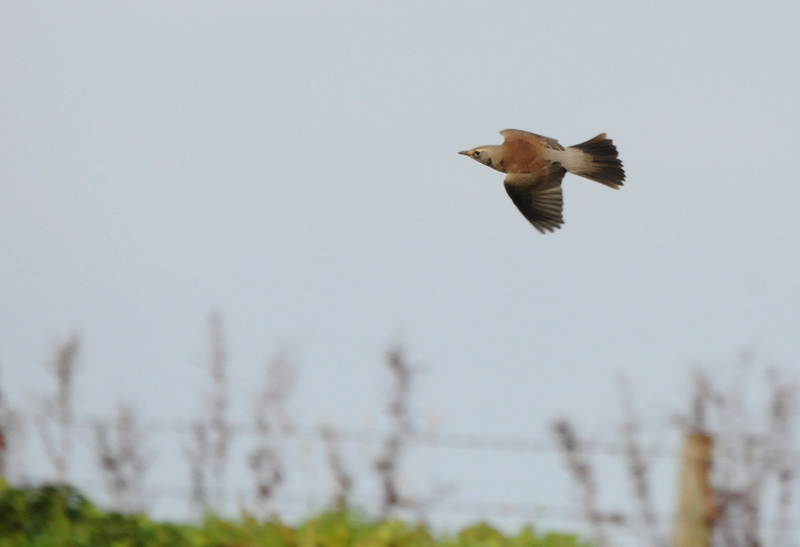 Also of note today were 2 Grey Plovers, 6 Rock Pipits, 353 Meadow Pipits, a Robin, 2 Song Thrush, 3 Whinchats, a Reed Warbler, 6 Blackcaps, 2 Willow Warblers and a Spotted Flycatcher. A cool grey day, with a light north-westerly wind. The sight of 4 Whooper Swans (with 3 adults having joined the bird which summered here) on Gretchen Loch from dawn may prove to be an sign of things to come as October draws nearer but they weren't the only arrivals of the day. In the afternoon, 3 Yellow-browed Warblers were found in the south-east of the island where there was also the first Sand Martin for a long time and other passerines of note spread about included 4 Whinchats, 3 Song Thrushes, 2 Garden Warblers, 2 Blackcaps, 2 Pied Flycatchers and 77 Snow Buntings. A Wryneck in the dunes at the back of Nouster beach was likely the bird seen irregularly through the week and most of the 6 Kestrels and 2 Sparrowhawks would also have been lingering birds. Some new waders included at least 3 Little Stints - with a new bird at Bridesness, another out south with Ringed Plovers and at least one lingering near the Lighthouse. 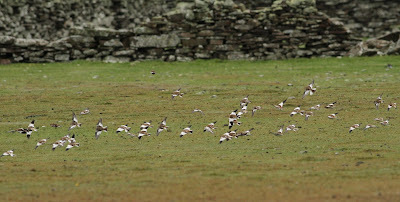 There were also 10 Black-tailed Godwits, an Arctic Skua off Bridesness and a Woodpigeon new in. There was also a distant sighting of 1+ Killer Whales off the Links golf course in the morning, though they quickly became distant and weren't seen again. A pleasant enough day with a light northerly breeze saw a significant arrival and welcome return of some popular visitors from the north. 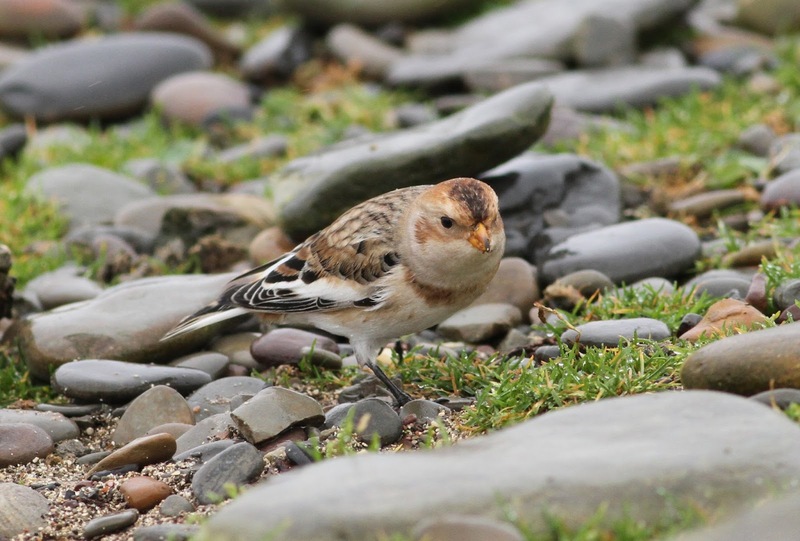 With just 13 logged the previous day, a significant influx of some 250 Snow Buntings took place, with three sizable flocks in typical locations at Bewan, Torness and Nouster and smaller groups spread about elsewhere. 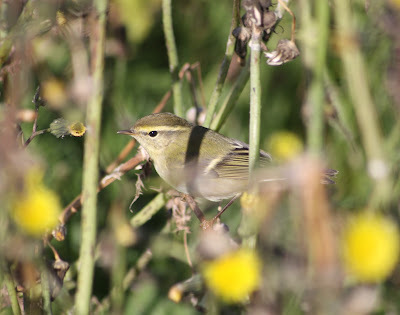 There wasn't too much change by the way of arrivals with other passerines but at least one of the single Yellow-browed Warblers at Holland gardens and Gretchen were new while 4 Rock Pipits may by indicator that their passage was about to begin. Non-passerines were more prominent with 12 Red-throated Divers off the coasts, 3 Sooty Shearwaters during a sea-watch, 5 Grey Herons and a small increase in numbers of most wildfowl species with an additional 2 Pintails seen. 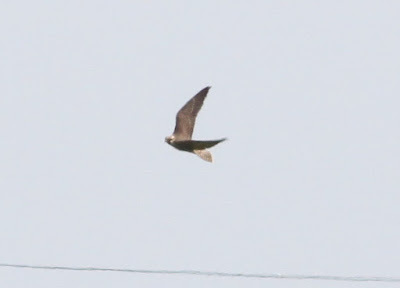 Raptors were well represented again with a ring-tail Hen Harrier, 4 Kestrels, 2 Sparrowhawks and at least 2 Peregrines with the most notable waders being the 2 Little Stints, 49 Knot, 22 Ruff, the first Whimbrel for weeks and the lingering Wood Sandpiper. Fog and drizzle made for a much wetter day than had been forecast but as has been the case all week, the Obs team, Guests and Heatherlea tour group between them contributed to another decent day. A Wryneck at the Observatory at dusk, the 2 Barred Warblers (Holland and Senness), a Yellow-browed Warbler at Rue and 2 Little Stints in the Trolla Vatn area all drew plenty of attention. 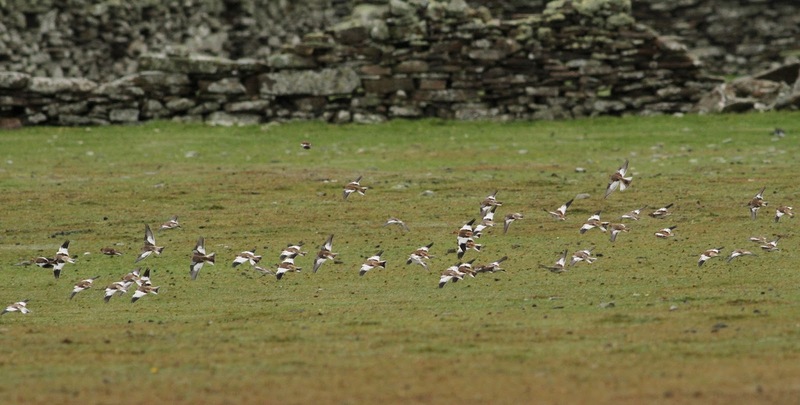 Having said that, in terms of a birding spectacle it was the continuous passage of flock after flock of Gannets in an easterly direction past the Observatory in damp conditions all morning which was the main talking point of the day. The estimation of 5000 birds (conservative in our opinion!! 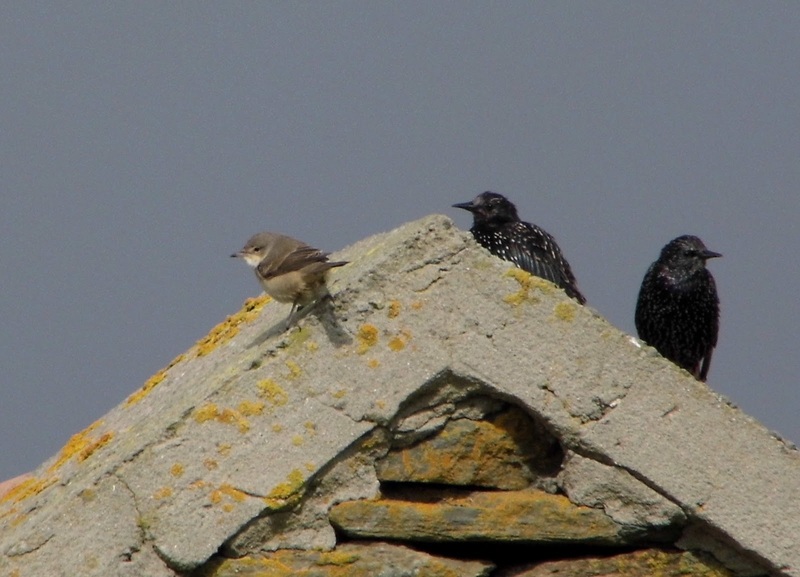 ), doubles the previous record day count and we can only assume they had come from an unseen feeding frenzy out in the fog somewhere to the west of the island. In the same area were 4 Sandwich Terns (the first of the month) and 9 Red-throated Divers were in Nouster Bay with a Short-eared Owl the first of the week and 2 Sparrowhawks and 5 Kestrels the other raptors. Migrant tallies were similar to yesterday but those showing an increase or were clearly new included the 5 Redstarts, 15 Blackcaps, 3 Spotted and 4 Pied Flycatchers, a Siskin and 13 Snow Buntings. Species slightly lower numbers, but likely to still have included some new individuals were a single Swift, a Tree Pipit, 3 Whinchats, 76 Wheatears, a Song Thrush, the Reed Warbler and Lesser Whitethroat, 14 Willow Warblers and a Goldcrest. A much better day weather wise and although there were clearly some new arrivals the spread in species was similar to how the week has gone so far. 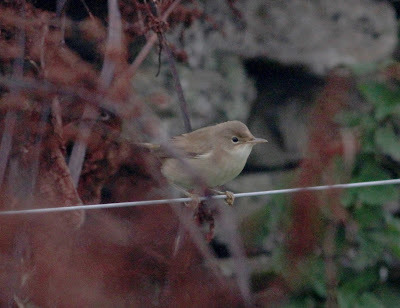 The 2 lingering Barred Warblers were the days main highlight while several passerine migrants showed an increase having no doubt arrived during yesterdays rain. Seen were 3 Tree Pipits, 223 Meadow Pipits, 4 Redstarts, 7 Whinchats, 89 Wheatears, 2 Fieldfares, 3 Song Thrushes, a Reed Warbler, Lesser Whitethroat, 10 Blackcaps, 20 Willow Warblers, 3 Goldcrests, a Spotted and a Pied Flycatcher. There were also 8 Swifts, a flock of 10 Grey Herons at Westness, 2 Sparrowhawks and 5 Kestrels, 27 Ruffs, 24 Black tailed Godwits and singles of Green and Wood Sandpiper still. With a brief subsidence in the wind came a rare chance to open the Holland mist-nets first thing, but by mid-morning some serious rain had set in rendering birding attempts (although we did try) in the afternoon all but useless! There were no surprises in the nets with a selection of the expected migrants caught and ringed with the added bonus of a couple of male Sparrowhawks caught and a minimum of 5 present throughout the island. 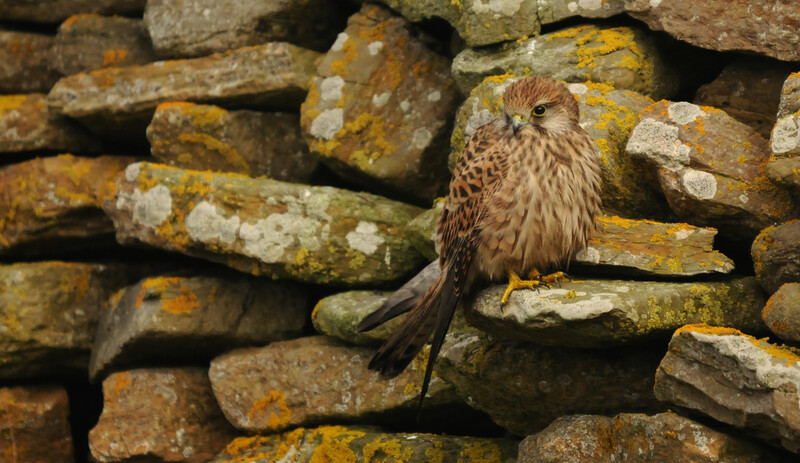 There were also 3 Kestrels, while a female Garganey on Gretchen among an arrival which also featured 100 Wigeon once the heavens had opened took 'bird of the day' prize. There was also a new Wryneck and Yellow-browed Warbler - both at the Observatory while the Barred Warbler remains at Senness. The days list for migrant passerines came to 2 Tree Pipits, 2 Robins, 3 Redstarts, 3 Whinchats, 52 Wheatears, a Fieldfare, 3 Song Thrush, a Lesser Whitethroat, 3 Garden Warblers, 2 Blackcaps, 9 Willow Warblers, 2 Spotted Flycatchers and 16 Snow Buntings. 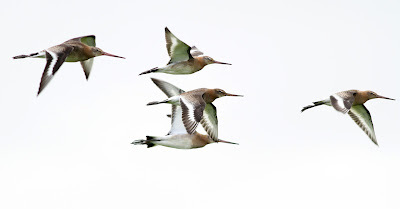 The Wood Sandpiper and Green Sandpiper were both seen again at Cauldhame, and there may well be 2 of the latter while Shelducks definitely increased to 2 birds and there was one each of Common and Arctic Terns seen. 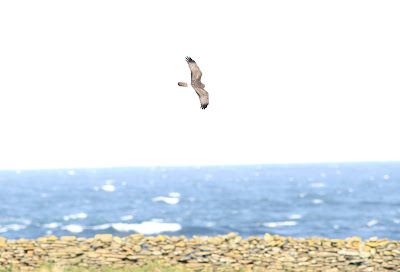 The south-east wind continued to blow at a gusty rate throughout, although with bright sunshine on both dates it felt like some of the 'goodies' were missing us. Such conditions though were good for raptor passage and having noticed 100 odd Sparrowhawks having been present on Utsira, off the Norway coast a few days ago, larger than normal numbers were then recorded passing through North Ronaldsay. At least 3 individuals were seen on 12th, with 4 + the next day but calculating the numbers was tricky and the total was more likely double this. Accompanying them were 6 Kestrels on 12th - 5 next day when the juvenile Marsh Harrier returned to the island again. There was some detectable wader passage again with a Green Sandpiper on both dates, 2 Common Sandpipers on the former and a Wood Sandpiper, 170 Knot and 24 Ruff on the latter. Passerines kept coming in dribs and drabs with a Red-breasted Flycatcher at Scotsha the highlight plus a Tree Pipit, 79 Wheatears, 3 Song Thrushes, the Barred Warbler still at Senness, a scattering of other warblers and 7 Snow Buntings on the 12th. The 13th delivered another brief RBF - this time near Gretchen with a similar range and numbers of the passerine species mentioned for the previous day. 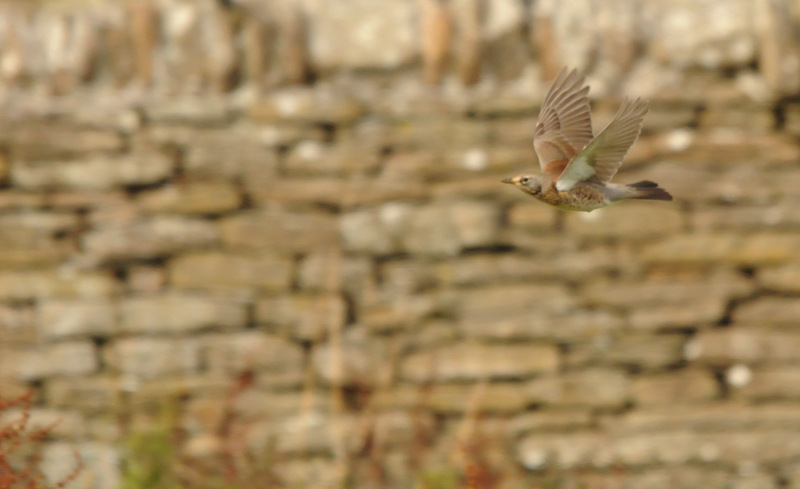 New birds continue to trickle in as the south-easterly winds continued for another day. 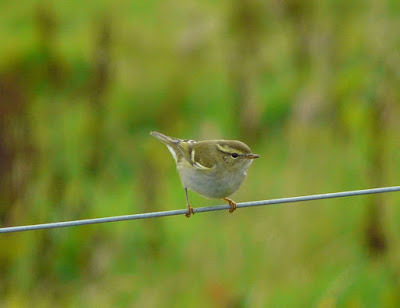 A brief Wryneck at the Observatory was new with 2 Barred Warblers (lingering bird at Sennessand a likely new one at South Ness) and a Yellow-browed Warbler (Ancum House) the main highlights. Some of the commoner migrants could more easily be attributed to newcomers with most of the 3 Kestrels, a Common Tern, Woodpigeon, 5 White Wagtails, a Redstart, Fieldfare, Lesser Whitethroat, Garden Warbler, Blackcap, 6 Willow Warblers and 4 Pied Flycatchers considered freshly arrived. Despite the promising conditions it was once again a bit of a struggle to find too many new birds but hopes remain high with the easterlies set to continue and rain forecast at the weekend. There was no sign of the Citrine Wagtail today so 'top of the tree' were a Yellow-browed Warbler at North Manse and 2 Barred Warblers - at Holland gardens and Senness. The best of the rest comprised 3 Grey Herons, the Marsh Harrier, a Wood Sandpiper, 238 Great-black backed Gulls (the highest count for some time), a Reed Warbler, 4 Willow Warblers and a Pied Flycatcher. 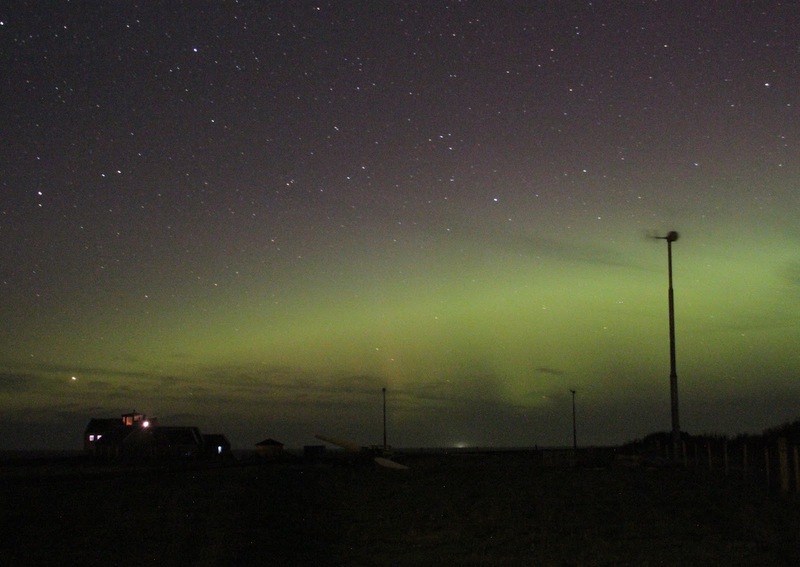 At least 1 Risso's Dolphin was seen off the north end while a pretty good showing of the Aurora Borealis from 10.30pm onwards drew a crowd. 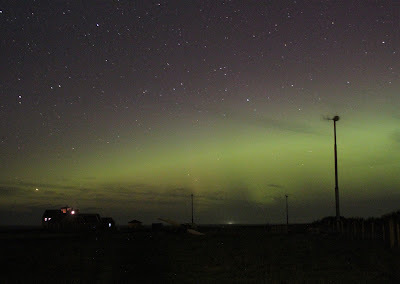 The moderate south-easterly wind delivered a few birds today, but on the whole there's very much a feeling of 'more to come' as the week progresses. 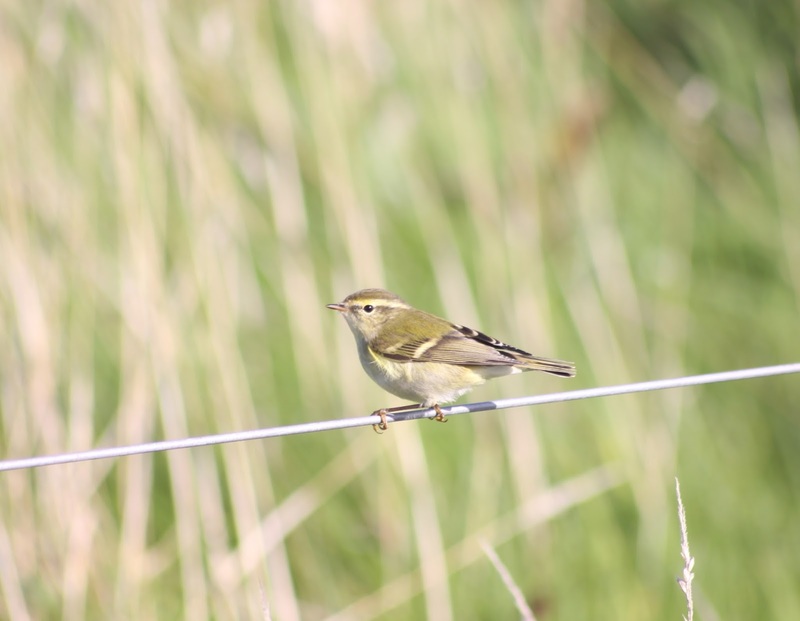 The first 2 Yellow-browed Warblers of the year lurked in the Irises at Ancum Loch and Westness respectively with the Citrine Wagtail, now at Bridesness maintained top billing for another day. A mixture of new and old passerines worthy of a mention included 4 Whinchats, 50 Wheatears, 2 Sedge Warblers, a Garden Warbler, 2 Pied Flycatchers and a Tree Sparrow. The Marsh Harrier remained, with 3 Pintails new among ever increasing number of wildfowl and 11 Sooty Shearwaters passed by in a brief sea-watch. Another good day in the field but this time some better weather. The Citrine Wagtail had re-located to the Hooking area where it commuted between the Loch and the beach while the days other highlights comprised 2 Barred Warblers (Observatory and Howar), 2 Rosefinches (Holland and Sangar), a Wood Warbler (Howar) and Wood Sandpiper (Cauldhame flash). The sea also drew plenty of attention with 75 Sooty Shearwaters, a single Manx Shearwater, 28 Great Skuas, 90 Kittiwakes and 347 Auk sp. passing in 6 hours. 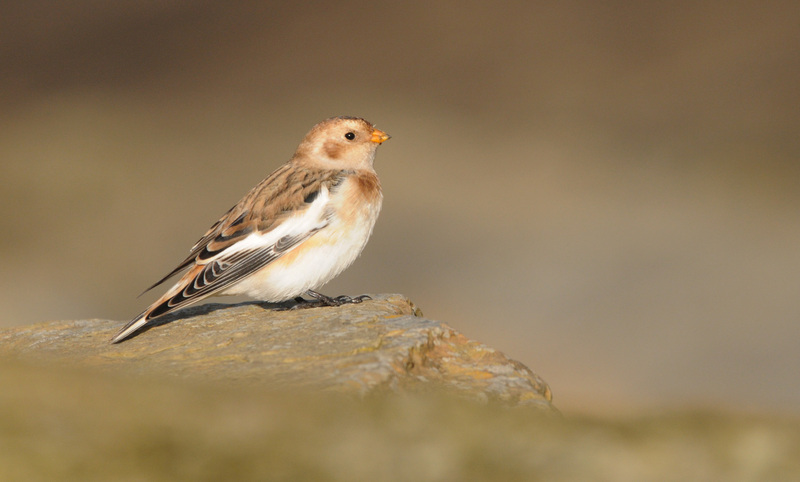 33 Ruffs and 71 Black-tailed Godwits were counted and new passerines included the first 2 Robins of the autumn, 4 Sedge Warblers, a Garden Warbler, 5 Willow Warblers (some lingering) and there were now 3 Snow Buntings at Bridesness. 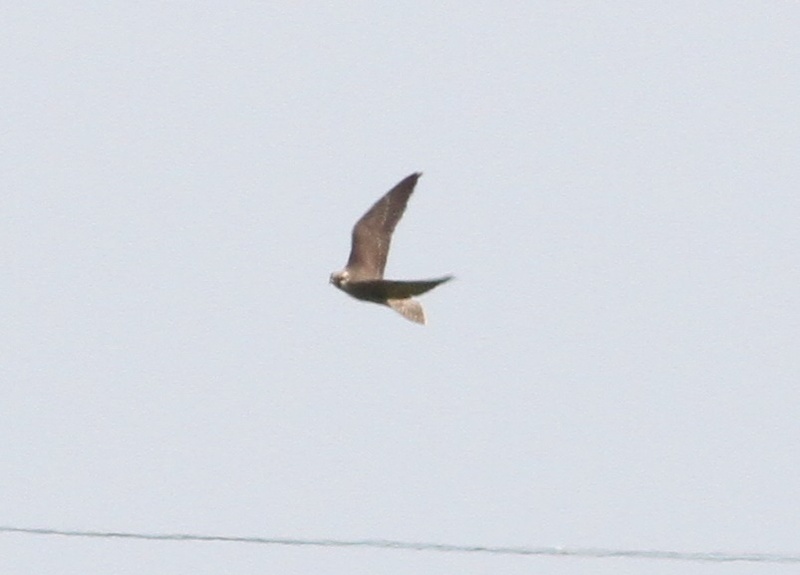 Perhaps one of the most interesting birds seen today was this potential Arctic (tundrius/calidus) Peregrine. 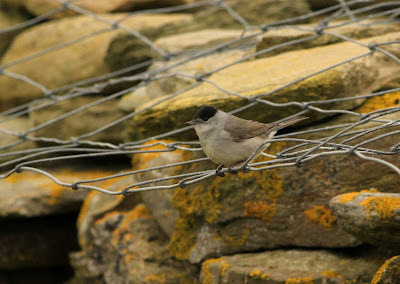 The bird certainly looked interesting and reminiscent of the Sep 2012 individual on a fly-by at Holland gardens this evening while photos taken of a Peregrine seen earlier were clearly this bird and have also proved educational. Hopefully we'll secure better views and images tomorrow. A grim day weather wise, with unpleasant drizzle showers turned into quite a productive day with plenty seen. 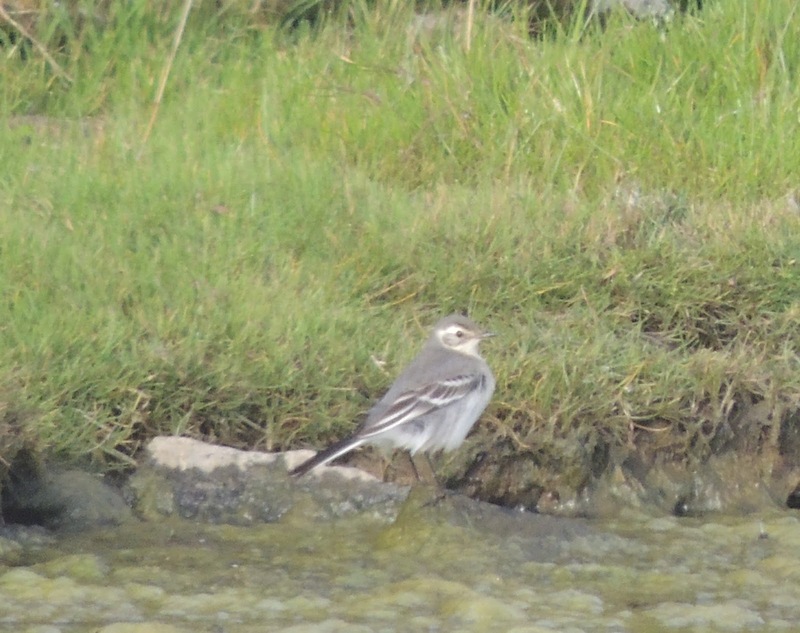 A juvenile Citrine Wagtail at Bridesness and Greenish Warbler at the Observatory were the days highlights and while the Wagtail may well have been a new bird the latter was clearly the same, ringed individual. The Rosefinch was still at Holland, there was also a Barred Warbler at Howar, the Snow Bunting still at Bridesness where 31 Black-tailed Godwits came in late evening making 75 in total.